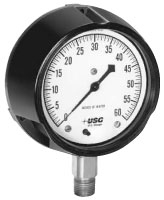 1929 Series Gauges are process gauges designed for pressures as low as a few inches of water. Heavy brass U-frame construction, and minimum and maximum stops to prevent pinion disengagement. These can also be used with a Type L diaphragm seal for use on corrosive or viscous fluids.